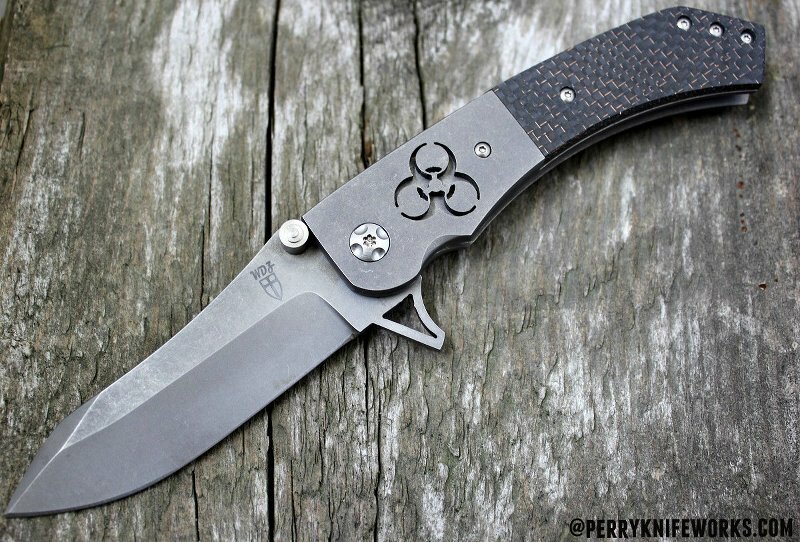 This custom Will Zermeno Azrael tactical flipper knife with LSCF, titanium bolster and biohazard cutout handle and stainless CPM154 blade. Polished titanium spacer pins, stonewahed pocket clip and dual thumb studs. Titanium pocket clip is mounted for blade tip up carry. Bearing pivot make opening the blade quick and easy. Dual thumb studs as well as a flipper for easy right and left hand opening. Flipper also serves as an index finger guard in the open position. Rock solid integral frame lock design with a lock bar stabilizer to prevent over extending of the lock bar. Sorry its been sold. In the future just click on the image or link and will redirect you to sales info.